priate song," said Bill Wilson, who was a policeman before taking the stadium job. A 233-officer contingent from the San Diego Police Department will work with 1,200 private security guards at Wednesday’s concert, which also features heavy metal bands Metallica and Guns N’ Roses. Ice-T and his speed-metal band Body Count is scheduled to open the concert. 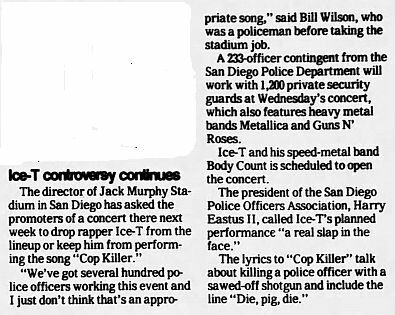 The president of the San Diego Police Officers Association, Harry Eastus II, called Ice-T's planned performance “a real slap in the face." The lyrics to "Cop Killer" talk about killing a police officer with a sawed-off shotgun and include the line "Die, pig, die." Rapper Ice-T will remain on next week’s concert bill at San Diego’s Jack Murphy Stadium but has agreed not to perform his “Cop Killer” song, a promoter said. 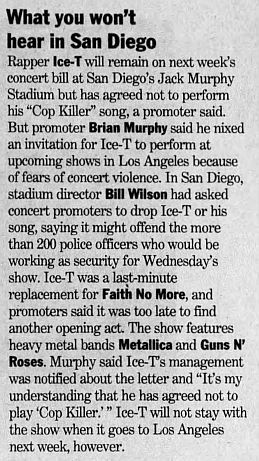 But promoter Brian Murphy said he nixed an invitation for Ice-T to perform at upcoming shows in Los Angeles because of fears of concert violence. Ice-T was a last-minute replacement for Faith No More, and promoters said it was too late to find another opening act. The show features heavy metal bands Metallica and Guns N’ Roses. Murphy said Ice-T's management was notified about the letter and “It’s my understanding that he has agreed not to play ‘Cop Killer.' ” Ice-T will not stay with the show when it goes to Los Angeles next week, however.